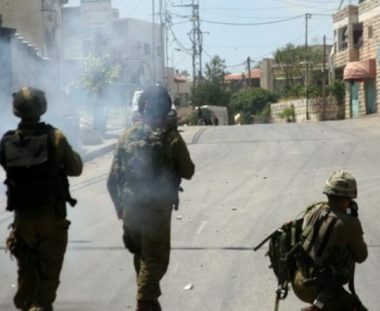 Israeli soldiers invaded, on Friday evening, Abu Dis town, east of occupied East Jerusalem, and injured many Palestinians, after attacking locals who protested the invasion. The soldiers fired dozens of live rounds, rubber-coated steel bullets, gas bombs and concussion grenades, while local youngsters hurled stones at the invading army jeeps. The Palestinian Red Crescent Society (PRC) said one Palestinian was shot with live fire, six others with rubber-coated steel bullets and fourteen suffered the severe effects of teargas inhalation. One Palestinian suffered various burns, in addition to cuts and bruises, the PRC added.